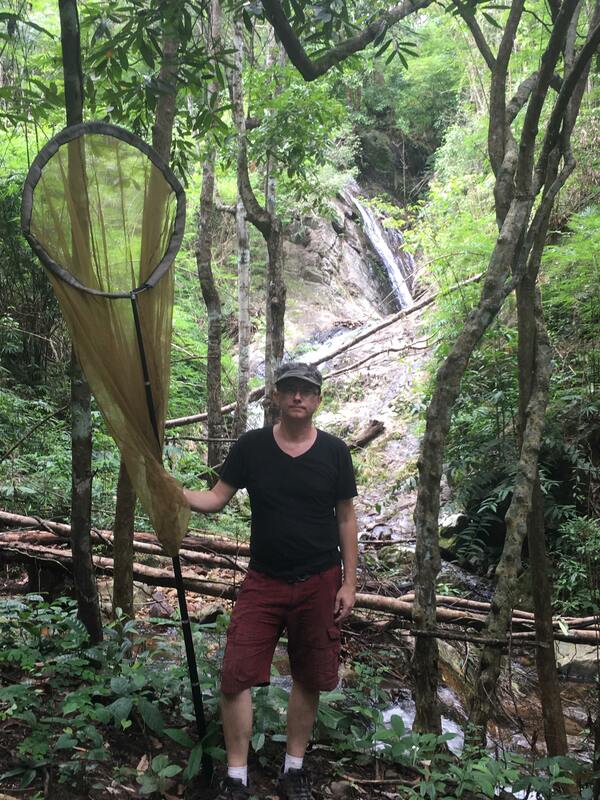 Many entomologists will know the Philippine island of Palawan as a heaven for its very varied insect fauna and infamous malaria infested rainforests. Palawan is the island in the Philippines with the most original forest cover still remaining (approx. 56%) and environment protection laws place the whole Province of Palawan under special protection as a biodiversity reserve. No commercial logging has been made in Palawan since a total logging ban in 1992, by Presidential Proclamation. The human population is just below a million – less than 1% of the Philippines population. Nature is still mostly pristine and exotic palm beaches attract more and more tourists. Some nature degradation is obviously ongoing, especially by mining operations and slash-and-burn farming, but at least there is quite a drive by local, national and international environmentalists to try halt this. As regular members and readers of ICF will know, I have a special relation to Palawan, as I lived there for 12 years, leaving in 2007. I now spent a decade in Scandinavia while my kids finish(ed) their education and get/got their life started. The longer time I spend away from the good and simple life I had in Palawan, the more I wish myself back there! When I came back from the Philippines to Europe, I found that the country (Denmark) I knew from my childhood and teenage years had changed sooo much – I felt like a complete stranger to my own roots! The political landscape, increased social inequality, huge immigration issues and selfishness like I have never known before in my life. How could I not wish myself back to Palawan, asap? I do not see much future for myself in Europe anyways as I have no assets here and never can see myself having a chance at getting any, not to say, I also wouldn't care about ending my days here. The Philippines, along with a number of other developing countries, seem to be going “seriously” forward nowadays. I watch and read news from the Philippines on a very regular basis and there truly are so many development and infrastructure projects going on and they are just set to increase even further. Depending on the parameters, the Philippines is in the top 7-12 fastest growing economies worldwide. Bureaucracy and redtape appears to be continuously decreasing, making business more easygoing and viable. During a holiday in Palawan in 2011, I was surprised to see just how huge the change was in just 5 years of absence – I hardly could recognize the Puerto Princesa City I had lived in for more than a decade! The tourism industry is being heavily promoted alongside sustainable agroforestry and sustainable ecological or eco-friendly agriculture. Tourism is absolutely the future of Palawan due to its stunning natural beauty of white sand beaches and forested hills. Late 1999 the tourism numbers in Palawan reached 100.000 tourists and I remember how local tourism organizations were over their heads exited to reach that goal. A new Korean made International airport terminal was opened in Puerto Princesa – the capital city of Palawan – earlier this year and local tourism organizations was worried about the terminal reaching its projected capacity of 2 mill. already within 1-2 years. That is a 20-fold increase in passengers in just 19-20 years! The development is projected to continue on an increased curve so that by 2025 the tourist numbers in Palawan is projected to reach about 3,5 mill. tourists. Thus far Puerto Princesa airport is served daily by 14-16 domestic flights – 5 times more than 10 years ago. Direct international flights from China, Korea and Singapore is projected for 2018. Also this year, the much enlarged San Vicente Airport in northern Palawan was re-opened, taking Airbus size planes, though only for domestic use, landing just a few km. from the 18 km long San Vicente beach, the longest in the Philippines, and virtually dozen upon dozen beaches and smaller coves. On the northern island of Coron, off northern Palawan island, a Nickelodeon theme park (as seen in Malaysia) has sparked much fury among local environmentalists, but it nevertheless seem to push through. Internet speeds is still a real issue in many parts of the Philippines, especially outside the major cities. This is however being handled with a ambitious fiber optical network, now more than 78.000 km. in length. From Luzon through Mindoro a 620 km. submarine fiber optical cable to Puerto Princesa has been completed and now the big task of connecting subscribers remain. Also this year, the construction of a 600 km. long 6 lane super highway was started in Palawan, to connect the far south to the far north of the island. So infrastructure is being continously improved and transport and communication will “soon” be up to international standards. When I settled in Palawan in 1994, a 500 USD monthly budget would give my family a life in luxury and rather costly private schools for the kids and private health clinics/hospitals. 10 years later, 600 Euro monthly budget (at a higher exchange rate than USD) would leave us struggling from day to day. Two accountants in my wife's family in Palawan make 325-400 Euro a month and my brother-in-law who is a ranking marine and Navy Seal in the Armed Forces of the Philippines is making 650 Euro a month. While I lived in Tenerife in '12-'13, I often talked to persons making about the same monthly salary! So in a few years, salaries may well be even more similar to those of southern Europe. Purchasing power is on the increase and I feel that I would have a chance at a good retirement in the Philippines, cashing in on this advance of tourism influx and improved buying power even by the local population. When I lived in Palawan, tourists were mostly low-budget backpackers, from which you could make a bit of income, but many locals had next to nothing to spare. The locals was just bad business. This has absolutely changed nowadays and with a growing financial capacity, many locals move from hard unsustainable farming practices into the tourism service sector, abandoning previous forest and nature destructive practices. So I could see myself as a sustainable eco-farmer in Palawan on my “older” days – though I have another tourism based idea on my planning board. As always, it's all about the money and who stands to benefit the most in this cycle of development. Politics over there is notoriously corrupt so laws can be changed or broken with a mere "slap on the wrist" or a "look the other way" approach. New roads only open up the interior and more resorts only entice more people from the main island to work there and live permanently. I do hope you get there before it's all too far gone. Just more expansion and population growth. Sumatra and Java used to be pretty nice too. I am afraid Chuck and Trehopr1 are right, while for sure it would be easer for us westerners to leave in such a paradise having beautiful primary forest on the right and modern shopping mall on the left but somehow those two don't come along and in the long run it will not do any good for natural environment and impact still will be there even with all laws protecting the island. I sure understand and share your concerns about things going the wrong way as population and development encroaches on nature. The most important thing in preventing forest and general habitat destruction is to stop all commercial clear cutting of forests. Commercial logging can be stopped by a simple stroke of a pen, by law, that is actually enforced. This has been the case in Palawan since 1992. Even private land owners in down town city proper of Puerto Princesa have to apply for permits from the Department of Environment and Natural Resources (DENR) to cut trees on their property or risk heavy fines for illegal logging. And the law is actually enforced - I know from my living there. Handing out land plots for free, or next to free, and the following indiscriminate clear cutting of forest, like in some places in Brazilian Amazonas is just not going to happen in Palawan. Prohibiting and abandoning of slash-and-burn agriculture practices by poor farmers is another issue that need to be tackled and that used to be a real problem indeed. Now a prohibited and punishable act, slash-and-burn agriculture practices has been reduced a lot by information campaigns and poverty alleviation or alternative livelyhood options. Obviously more work needs to be done to lift the poorest part of the rural population out of the negative spiral of slash-and-burn agriculture practice, a hard life that obviously no human wants, if they have other means of making a living. Development need to include and not exclude people. Who wouldn't rather work in the service industry, getting food on the table daily, than be a mountain farmer with a failed crop? I am not in any way claiming that things are good or perfect in Palawan in these respects, but as I said in Adam's thread on the Ornithoptera alexandrae conservation project, the other day, when finally there is an attempt to do something good, it need to be supported. And yes, human population WILL go on in its direction and its all up to those of us that are aware and concerned about where this world is going, to support work going in the right direction. Maybe its a bit overkill to put it like this, but if a population is able to make a modern urban living from trade and service, green renewable energy and farming practices - like its done in places like Hong Kong and Singapore - then people will not be "forced" to, and have no "need", to destroy natural habitats. The fact that much forest has survived in Palawan to the current age of cheaper and more viable renewable energy (like solar and wind power) and much improved, resource friendly, low tech, farming practices (like aquaponics and vertical farming), makes me feel confident that Palawan forests do have a real chance of survival and thereby the survival of its its vast flora and fauna. Teaching locals to utilize local and native food sources better in their daily cooking, rather than imported - domestically or internationally - produce, will allow them to make a living, while saving money from flowing out of their local community. Some weird dude in the US said that climate change was a Chinese hoax while he wants to retain stone age fossil fuels, that controls the world economy. The Chinese invest heavily in green energy at home now, while also making top dollar exporting solar cell panels worldwide (obviously it also happen in the US!). The Philippines is set to have a million Electric Vehicles by 2020 and Palawan just need to be in on this too. Some are already in operation in Puerto Princesa as shown on youtube. So I do not see why having a primary forest on the right and a shopping mall on the left should be a unlikely combination - Hong Kong and Singapore has quite decent natural habitats right "across the street" from high-rises. People being busy making a real living and lead the "easy" life would stay out of the forest. Having said that, it is absolutely likely that most easily accessible (flat) lowlands will be the human sphere, populated by residences and farmlands. The interior mountain ranges may well remain islands of good forest and habitats, like it is today. Japan is a much forested country and if provided similar human living conditions, Palawan could well develop the same way as long as the current forest cover remain. Japan could well be a role-model for forest conservation also in a place like Palawan.